cutting that go down Lime St Station Liverpool. The inscription at first floor leval on both lodges commemorate both the dedication and opening ceremonies. Both lodges are buildings of special architectural and historical interest therefore they are both Grade 2 listed buildings. 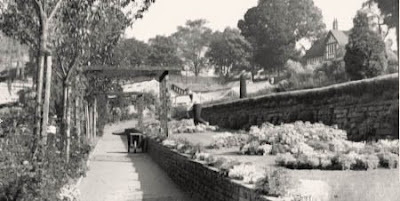 In the apex of the roof on both lodges facing Victoria Avenue are two unique witticisms on the two people who the park owes its very existence to. On the east lodge is a painting of a bat,moon and tree in yellow and green. A pun oa Sir Richard Moon, Chairman of the LNWR Company. Whilst the west lodge has a spider's web, a tree and a spider, a pun on Francis William Webb. Curator's Lodge which contains his pun) and Francis William Webb (facing west towards the Lodge with his pun upon it). At the rear of the clock is a cast iron plaque explaining how the clock tower was donated by the employees of the Company and unveiled by James Middlelon. Middleton was given this honour for fifty years service to the Company, quite an impressive achievement. Even more impressive when its realized that Middleton was the driver of the first train that stopped at Crewe on the 4th July 1837. The Cafeteria standing behind the Memorial is aptly named the Jubilee Cafeteria to commemorate the Jubilee of Her Majestry Queen Elizabeth II, being officially opened on 12th June 1977. It is reputed that there are only five trees to remind everyone of the hedgerows from the fields of the original farmlands of over a hundred years ago. They are of course all Oak,three are by the play area, whilst two more are near the Aviary. Most of the trees within the Park have been planted under the guidance of the four Park Curators. Obviously many were planted when the Park was First being created, for instance, the giant Atlantic Cedars. Many of the trees which have been planted by successive Curators over the last 40 or 50 years are now reaching maturity, so its these people to thank for such a remarkable array of trees within the Park. Hayes, on the spot where Station House now stands in Victoria Avenue). 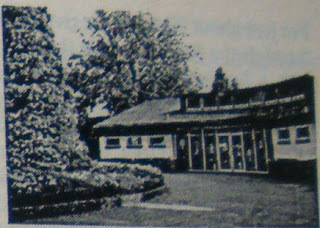 The first boathouse was being pulled down in 1937 so she donated money to enable it to be converted into the first Aviary. granite and was washed down in that period of time. It was discovered when the Foundations for part of the original Company Works was being excavated.